This week we have been working on a project for a toilet manufacturer making a device which will count and log the number of times a toilet is flushed or partially flushed. Although flow meters are already in place to measure the exact volume of water consumed by the toilets being tested, the key metric to calculate accurately is the amount of water used per flush, and to obtain that information it is essential to also count the number of times the toilet has been flushed. There is no easy direct way to detect whether a full or partial flush has occurred, so two float switches have to be inserted into the toilet cistern – one just below the full cistern depth and the other just above the cistern depth immediately after a full flush. When the level of water in the cistern drops below full (indicated by the upper float switch going low), we know that a flush has begun. Typically a full flush will take around 5-10 seconds at most to empty the cistern into the bowl (at which point the lower float switch will go low). Our system waits for up to 15 seconds to see if a flush is a full flush. If during that time the lower of the two float switches does not go low, it knows that a partial flush occurred. 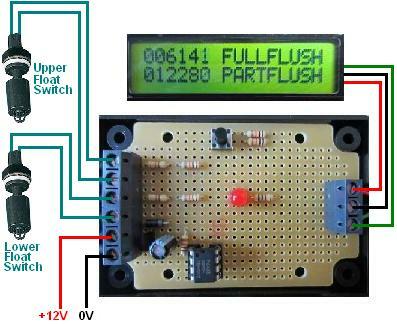 This flush is then added to the relevant counter – full or partial – and displayed. The system then waits for the cistern to fill up again, and when upper float switch goes high it re-arms the flush detector ready to detect the next flush.